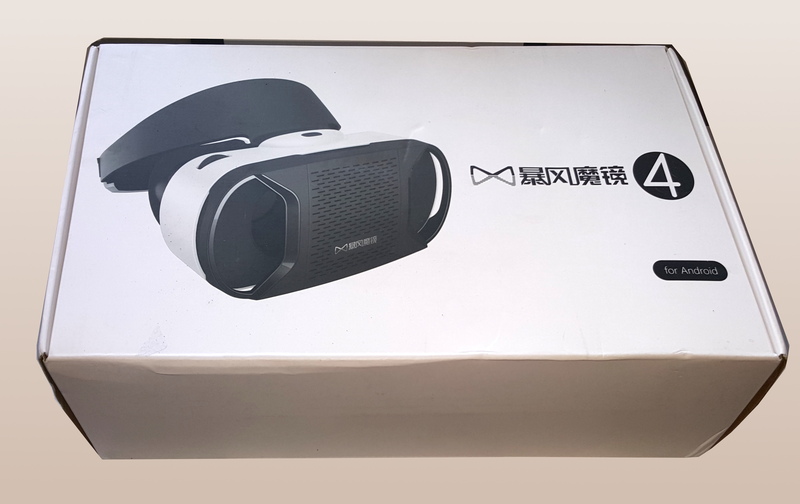 Last month, I wrote a review of the Baofeng Mojing 3, which immediately became my favorite Google Cardboard-compatible headset. Last week, GearBest sent me a new version of the same headset, the Baofeng Mojing 4, so that I could do a review. Baofeng Mojing 4 comes in a nice box. Disclosure: I got the $44 headset for free, in return for doing this review. I bought the Baofeng Mojing 3 with my own money from AliExpress for $38. It is also available from GearBest for $36. You can also order Baofeng Mojing 3 from Amazon for $40 and the Baofeng Mojing 4 from Amazon for $49. So is the update worth the extra $8? If you’re in a hurry, skip to the end of the article for the bottom line. Custom-cut cardboard to protect it during shipping, with protective plastic film covering the lenses. The two headsets look a bit different right off because of the head strap. The previous version had the standard three-point approach, holding the headset by the sides and with a third strap up and over the top of your head. The older Baofeng Mojing 3 is on the left, with the standard fabric-and-Velcro straps. The newer Baofeng Mojing 4 is on the right with that one circular plastic piece to hold it to your head. The new version has just one single circular holder that snaps in at the top of the headset then has an adjustable plastic widget on the back. It’s fancier, but I had a much harder time adjusting it to stay steady on my head. With their respective straps, both headsets weight just about 15 ounces, but without the straps, the new one weights just 10 ounces, and the old one weighs about 13, according to my kitchen scale. It also looks as though the lenses are closer to the phone’s screen, but the two sets are the same length and height. Both sets fit comfortably over my glasses, and both had bright optics and a nice, wide field of view. Open the front panel, drop in the phone, close the panel. Easy peasy. I didn’t even have to take the cover off my smartphone. The front cover snaps open and closes with two small but powerful magnets, and the phone drops right in and sits on a shelf — very easy to take it in and out. On the new headset, the front cover is open on both sides, allowing a phone’s camera to look out for augmented reality applications. On the previous one, the cover was translucent, instead. Both come with a small controller that’s easy to hold in the palm of your hand that pairs easily with Android devices. The controller works with two AAA batteries, which were included. It doesn’t seem to play well with the iPhone, but I’ve had problems getting controllers to pair up with the iPhone in general. 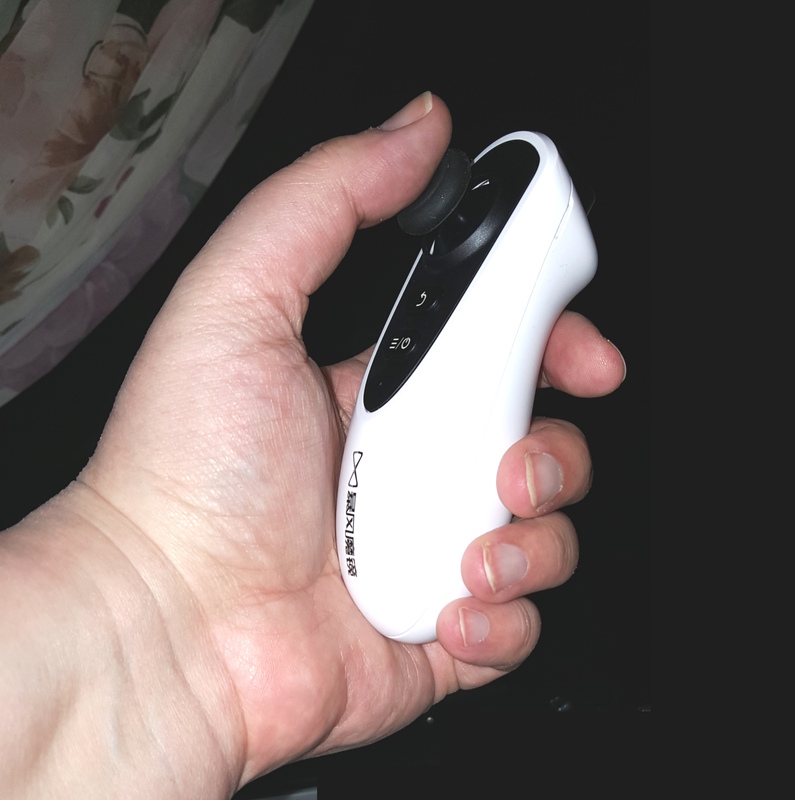 The controller fits easily in your hand, makes it easy to shoot down aliens. The two headsets also have different kinds of padding where they touch the face. Version 3 had a fuzzy, spongy material. Version 4 has just the bare silicon — easier to clean, but a little harder to get comfortable on your face, in my experience. If your face is shaped differently, you might have a different preference here. Finally, version 3 has two adjustments for the lenses. You can change the focal distance, which is the space between the lenses and the screen of the phone, and the interpupillary distance, which is the space between the two lenses. With version 4, you can only do the second one, possibly because it’s already set as close to the phone as it can get. The Baofeng Mojing 3 will probably remain my preferred headset since the Baofeng Mojing 4 hurts my nose and cheeks if I play more than a couple of levels of End Space VR. 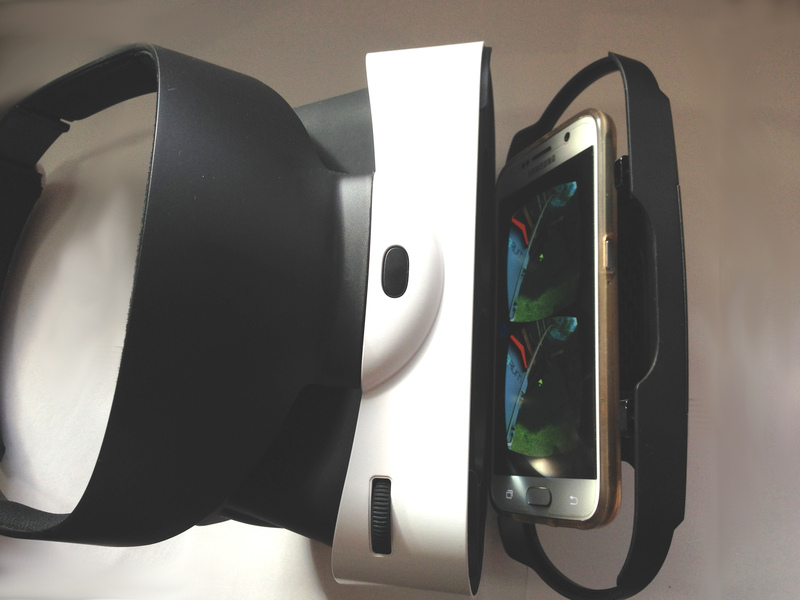 Gear VR, on left, and the Baofeng Mojing 4, on right. You might also notice that both versions of this headset, but especially the Baofeng Mojing 3, look a lot like the Samsung Gear VR. 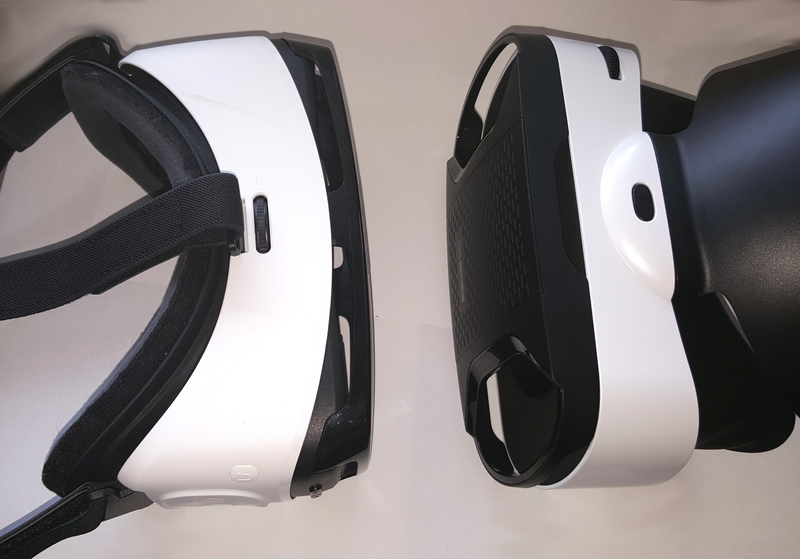 In fact, with the same kind of straps and padding, version 3 is almost an identical clone of the Gear VR. 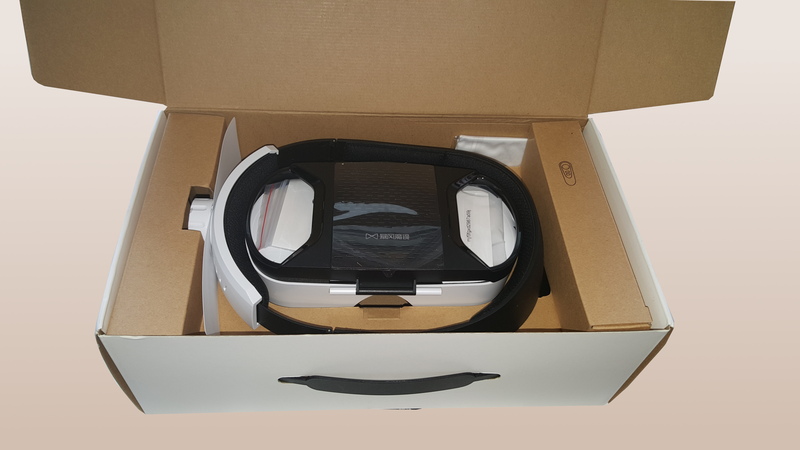 In case you don’t know what the difference is, the Gear VR only works with a handful of the latest models of Samsung smartphones, the phones are difficult to get in and out, it does not run any Google Cardboard apps, and has only a small selection of apps in its own app store, which also tend to be pricier than the Google Cardboard alternatives. But the apps also tend to be better, since they take advantage of the extra sensors that the Gear VR packs into its headset. The Gear VR also has a built-in trackpad, back button, and volume button on its headset. If you already own the Baofeng Mojing 3, don’t upgrade but wait for the headsets to keep getting better. If you’re choosing between the two, and like being able to adjust the focal distance, and prefer the traditional fabric-and-Velcro headstraps and nice padding around your face, go with the Baofeng Mojing 3. 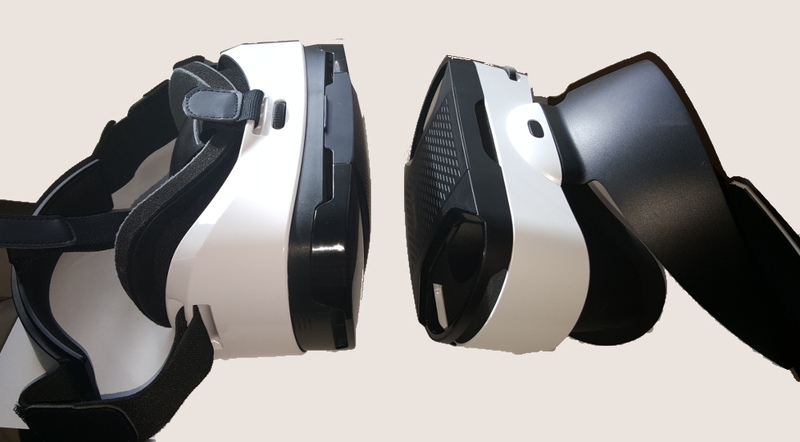 If I had my choice, I’d take the straps and padding from version 3 and use them with the lighter version 4 headset, since the focal distance worked for me without the adjustment knob. But maybe some people prefer the newer-style headstraps, otherwise the company wouldn’t have switched. Maybe it’s my hair braid that gets in the way? No — undoing it didn’t help. So that’s a big “no” on the Baofeng Mojing 4 on comfort. 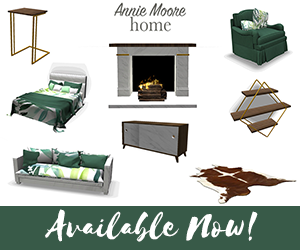 Ideally, you can try them both on and see which one fits you better. I’ll be at the Virtual/Augmented Reality Hackathon in Troy, NY with my full headset collection on April 16. 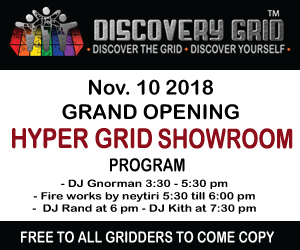 If you’re in the area, stop by and try them out. If you’re choosing between the Gear VR and the Baofeng Mojing, I would recommend the Gear VR for a better, more immersive experience — but suggest that you get a super-low-cost Google Cardboard headset as well, so you can play the Google Cardboard apps. Then wait for the Cardboard-compatible headsets to get a bit better before investing more money. Neither of the Baofeng Mojings comes with the QR Code that you need to calibrate the headset, but you can get them both here.